1. 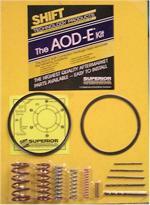 Just one Superior kit does both the AOD-E and the 4R70E/W-4R75E/W Transmissions. 2. The AOD-E kit offers regular and heavy-duty applications. 3. Use of this transmission in police cars many times means come backs due to unit failure. 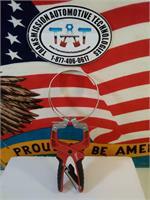 This package was largely designed and developed through field testing on police vehicles. 4. 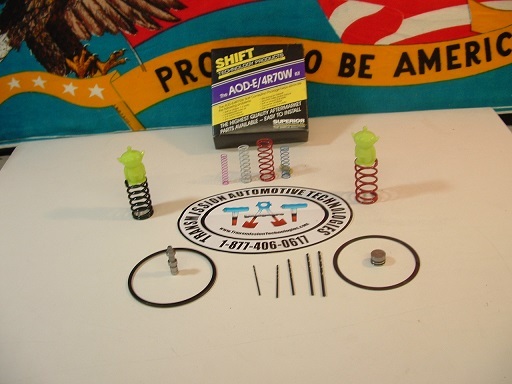 Included in this kit is a special design Spiral "Plus" ring set. The "New Millenium" two piece design in the AOD-E Shift Correction Package features the Spiral Ring and the G-lock ring, teamed up to withstand testing at over 16,000 RPM on a dynamometer. Even at that high speed the new design did not fail. 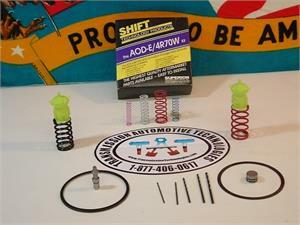 The New Spiral "Plus" ring set replaces the stock snap ring that often times slings off.